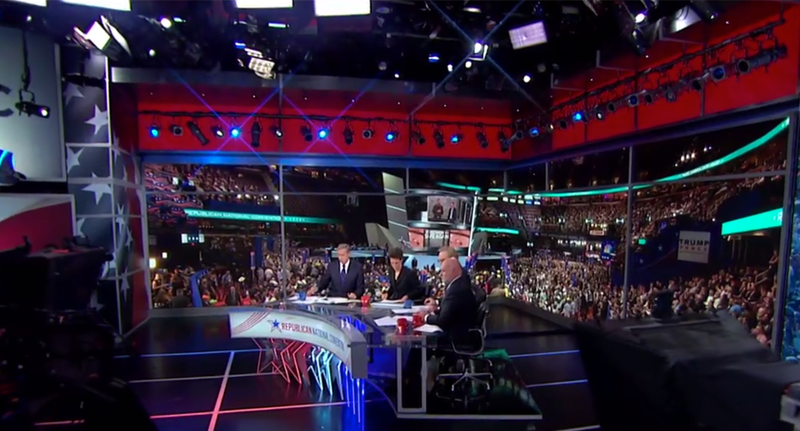 MSNBC debuted a newly revamped part of Studio 3A with its coverage of the Republican National Convention. The new look, designed by Clickspring Design and built by blackwalnut, is dominated by two LED walls designed to mimic massive windows that meet at a 90-degree angle in one corner of the studio. Above this is a backlit color changing space with a row of lighting instruments positioned in front of it — a design accent that’s part form and part function. The network worked with The Lighting Design Group to light the updated space. The revamped area replaces the two story monitor array, known as the “garage door” due to its ability to raise for storage access, that served as the primary backdrop for this end of the studio as well as a backlit wall with decorative framework and small monitor arrays. Meanwhile, the two “floating” rear projection screens that were part of the original set to the far left of this end of the space remain in place, as does a portion of the wall that’s often decked out with a printed graphics sporting an American flag pattern. On the opposite end of the new LED span from Leyard and installed by Production Resource Group is an existing stack of smaller flat panels that serve as sort of transitional design element. 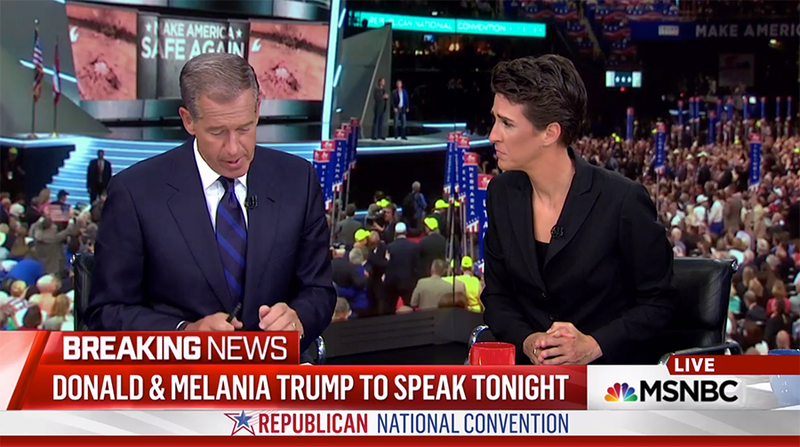 So far, the space has only been used for convention coverage, with anchors Brian Williams and Rachel Maddow sitting in front of the network’s existing star and LED band-fronted desk. This two shot is centered on the corner where the two video walls meet. The setup also allows for in-studio guests, who are shown in front of the LED panels and the stack of video panels to the far right. That panel, instead of being part of the faux “window” is used to display topical graphics. For its GOP convention coverage, the network is using a live feed of an overhead view of the convention floor to create a look of a traditional broadcast skybox, but no doubt the versatility of the walls will be used in other new ways once select MSNBC programming, including “Morning Joe,” returns to the space following the conventions. The use of LED panels in this space means it’s possible to create the large swaths of video walls that wasn’t otherwise possible due to the throw distance needed for rear projection screens, like those still being used in 3B. 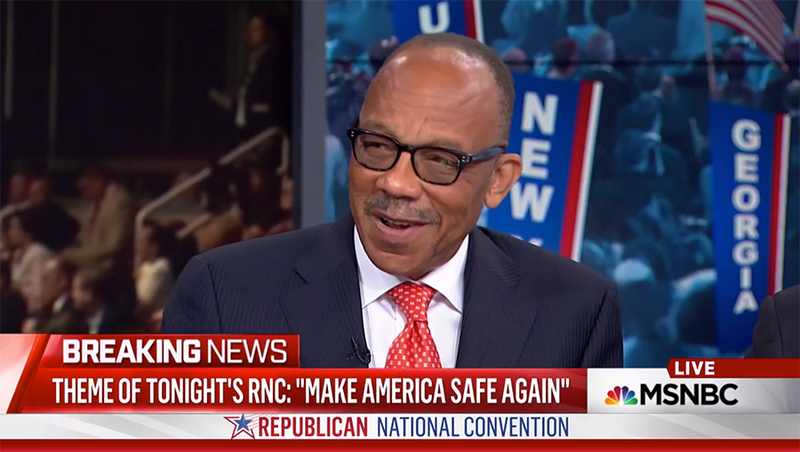 This portion of the studio closely mirrors and general layout and look and feel of the portion of Studio 3B that “NBC Nightly News” uses, which is an effective way to tie together the two networks’ look and feel. Studio 3A was originally designed as an integrated working newsroom set for both MSNBC and NBC News, with “Nightly News” originating from the adjacent Studio 3C, which was positioned at the opposite end of the space as this revamped set. That space has since been turned over to NBC’s flagship station WNBC-TV, with the windows between the two spaces removed in favor of walls. MSNBC also installed a “phone booth” sized studio in this area for breaking news coverage. The network has also reduced the studio’s use as a true working newsroom with the debut of the new level four studio.